Kiran Nadar Museum of Art is pleased to present Hangar for the Passerby; an exhibition about artist collectives – collaborative and participatory art practices – in India. Curated by Akansha Rastogi, the exhibition showcases the wide ranging creative output of more than 45 artist groups, collectives, cooperatives, contexts and individuals, covering a vast geographical and historical span between artists and art institutions from the 1930’s to 2017. Hangar for the Passerby marks moments of transference of ideas across generations and artistic practices through the juxtaposition of different models of collaboration as proposed by different artists. In examining and mapping emotional investments, challenges, failures and schematics of negotiations in artistic collaborations, the exhibition becomes a playground to discuss the ideas of and around ‘work’, and what is ‘artistic work’. Hangar for the Passerby revisits certain historical moments, speculating and re-enacting spatial dynamics of collectivity; it presents instances of formal and informal pedagogical exercises, workshops and participatory acts facilitated by many artists in institutional spaces. The main protagonist of the exhibition is the transient figure of the Passerby. In practice it is impossible to create a place for the Passerby who is either the most documented figure or an eluding presence, and thus a perfect antithesis to the collective or the mass. Hangar for the Passerby makes visible the process of art making and opens a discourse on art and craft in modern Indian art. The viewer enters the exhibition through the College Backyard project that resurrects the dumping ground or the dirty backyard of an art college which is full of overgrown foliage, moulds and debris of used and thrown away art material and broken parts of sculptures. Throughout the exhibition, the viewer moves between shafts, cavities, inclines, time warps, expeditions and wilderness, and encounters different groups of students and artists from different times and geographies. As it traces many left-out narratives and disrupts many genealogies from art history, the exhibition also introduces and reads new ones against the old genealogies. The exhibition is divided into six vortices; each one with a distinct character. At the core is ‘The Souvenir Shop’, one of the most important vortices, which is populated with the imagined produce of Group 1890’s Art Centre; that is to say, with ideas, objects, people and images of/from artist peers of Group 1890. It conjures an altered vision of art practices of 1960s and 1970s and, in constructing an Art Centre that exists only as a document, it reimagines several meetings these groups of artists, as well as performs a reworking of Group 1890’s manifesto. 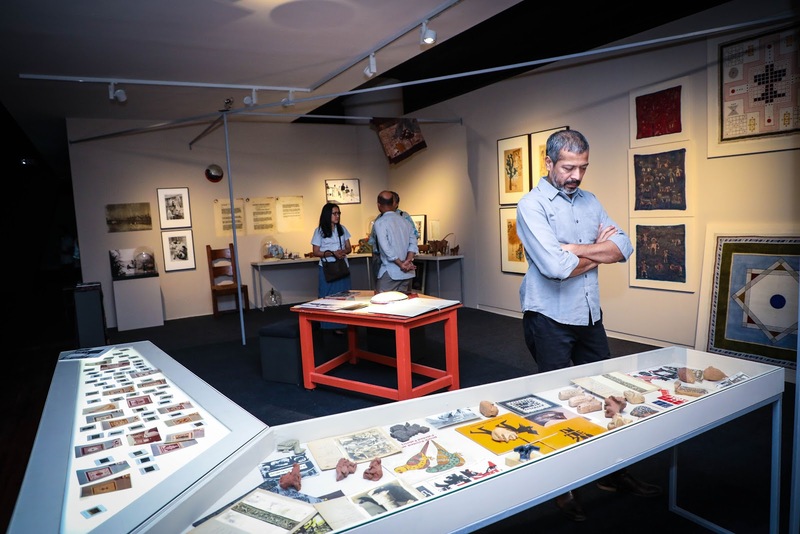 A large proportion of the works presented in the exhibition are on public display for the first time, having been loaned from the archives of public institutions and personal estates of artists; this includes batiks by artists from Cholamandal Artists’ Village in Chennai, toys made for the Baroda Fine Arts Fair by various artists, CAMP Roof, Rajeev Sethi’s unpublished manuscript ‘Three Stones’ on Anandgram and Bhule Bisre Kalakar Samiti. “This exhibition showcases such a vast and intriguing sweep of Indian modern and contemporary art. It beautifully weaves a rich tapestry of institutional histories of our modern art institutions, and makes KNMA a host to this network and conversations that are yet to happen about Future.” Kiran Nadar, Founder and Chairperson, Kiran Nadar Museum of Art. Saffronart’s upcoming Summer Online Auction, 6 – 7 June 2017, features a selection of contemporary South Asian art and important works from India’s finest modernists.